Minimum 2 persons per group. Kailash tour from Simikot begins with visits to UNESCO World Heritage Sites in Kathmandu then fly to Nepalgunj, a city in the western Terai plains of Nepal. From Nepaljung you will take the flight to Simikot from where your trek begins. 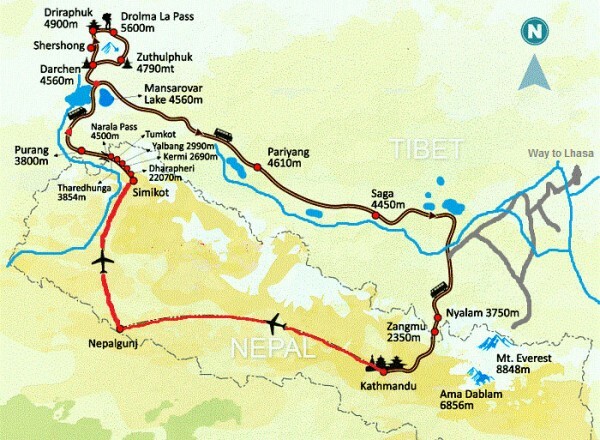 In May 1993 the governments of Nepal and China reached an accord that allowed the first treks across the border between the two countries. While it had been a route for Nepalese pilgrims for years, foreign trekkers were never allowed to trek from Nepal into Tibet. The journey through Humla, Nepal’s highest, northernmost and most remote district is culturally and scenically rewarding. It is only near Simikot, the district headquarters, that you will encounter people of other ethnic groups, mostly Thakuris and Chhetris. 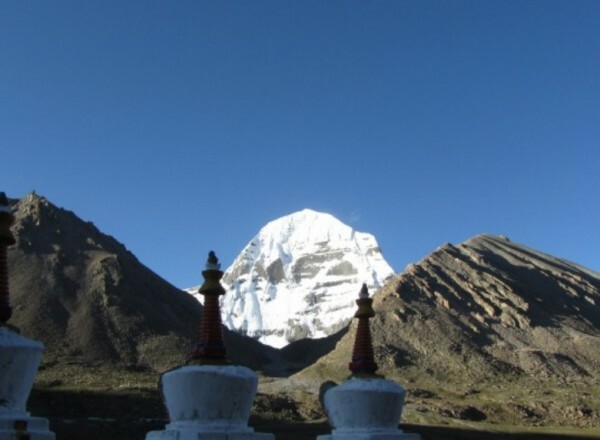 A trip to Mt Kailash has always been regarded as a pilgrimage. 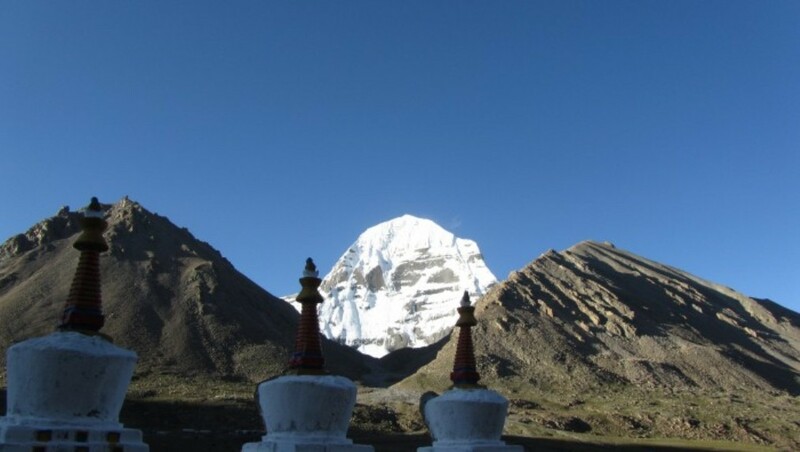 It satisfies the romantic in us that the pilgrimage to Kailash is a difficult one. Whether you drive for seven days or walk for six days, it is still not possible to make a quick, easy visit to Kailash and Manasarovar. 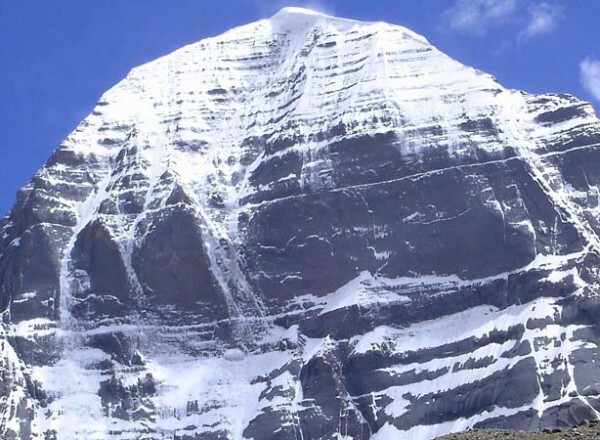 You cannot yet travel all the way to Kailash by helicopter or airplane. This is certainly as it should be. Day 05: Transfer to the airport for the flight Kathmandu to Nepalgunj, transfer to the hotel in Nepalgunj. Day 06: Flight Nepalgunj to Simikot. Starting point of the trek. Day 13: Cross the border with Tibet with a car and drive to Taklakot (3880 m). Visit the monasteries of Khojarnath. Day 14: Drive to Manasarovar lake (4650 m). Day 15: Drive to Tirtapuri and the hot spings. If he likes he can walk the kora around Tirtapuri. Day 16: Drive from Tirtapuri via the Kyunlung valley (if open) to Tsada (Tsamda or Tholing ). Day 17: Visit Tholing and Tsaparang. Day 18: Drive from Tholing to Darchen (4650 m). Day 19: First day of the Kora. Walk to Dira Phuk monastery (4860 m). Overnight in Dira Phuk monastery/guesthouse. 20 km, 6-9 hour. Day 20: Second day of the kora, cross Drolma la, walk to Zuthul Phuk monastery (4760 m) for the night.18 km, 9-10 uur. Day 21: Third day of the kora. Walk to the endpoint of the kora and further to Darchen. From here drive to Manasarovar lake. Overnight at Chiu monastery. Day 22: Drive from Manasarovar lake to Paryang. Day 23: Drive from Paryang to Saga. Day 24: Drive from Saga to Rongbuk. 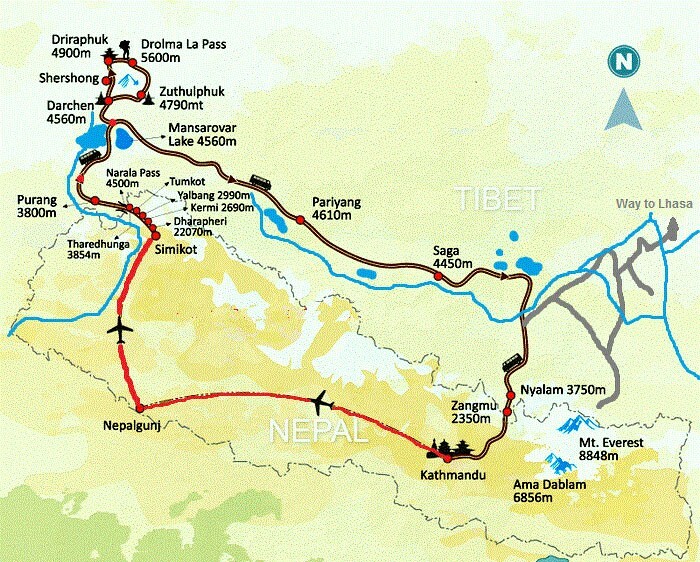 Day 25: Visit/walk to Everest basecamp. Then in the afternoon drive to Tingri. Day 26: Drive from Tingri to Gyirong via Peiketsu lake. Day 27: Drive from Gyirong to the border with Nepal and further to the hotel in Kathmandu. Day 29: Transfer to the airport for the flight back home.